You will notice that a lot of my studies will be in sanguine conte' which is basically akin to a hard pastel. I like the feel of it and can control it fairly easily. These are studies of males from my Thursday group. The moderator is very good at hiring a variety of models, both male and female. Both models here are equally good, but two very different body types. I still struggle with correct anatomical rendering, but I am working on it. These studies were actually done with different time constraints, from fifteen minutes to over an hour. I always try to get as much as I can out of these sessions, as male models don't seem to be as abundant as female ones. Please feel free to comment or leave constructive criticism. One could make the arguement that the study of the figure and the study of the human head can be two separate and lifelong endeavors. I love portraits, but I have difficulty capturing a likeness from my subject most times. This is one of those rare occasions that I felt I was on the mark. 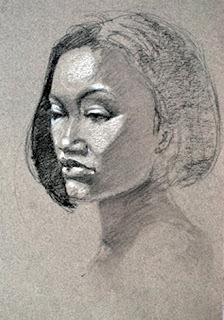 The model was a lovely young African-American lady with striking features. I often find myself going towards a formula when drawing a head, and usually the results are disatrous. I decided to go a different way here, and focus on copying the shape and placement of shadows, which proved to be a technique I have decided to stick with. This was only a twenty minute drawing. For several years, I have embarked on the journey to understand and discover the figure. I have some formal training in art in general, but I have had to find my own way in understanding specifically the figure and how it works. 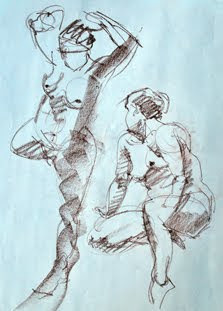 So, here are a couple of images that I have created in one of several figure drawing sessions I attend frequently. They are not led by an instructor per se, just a moderator who sets the pace and tone for the evening (lighting, type of pose, and length of pose). These are done in conte', the first being two 3-minute gestures, the next being a 20 minute study.